조선중기 이후의 것으로 추정되는 당의이다. 당의란 조선시대 궁중과 사대부 여인들이 저고리 위에 덧 입었던 예복으로 모양은 저고리와 비슷하지만 앞과 뒤의 길이가 길고 겨드랑이부터 아래로 트여있는 옷이다. 이 당의는 출토유물로 옷의 안과 밖이 모두 황갈색으로 변색되어 있어 본래의 색을 알 수 없다. 황갈색 바탕에 수(壽)와 복(福)자 그리고 칠보석(七寶石), 석류나무(榴) 등의 무늬가 섞여져 있는데 특히 금실로 수놓은 수와 복자는 다른 무늬보다 두드러져 보인다. 깃은 너비가 넓고 깃머리가 뾰족하게 각이 져 있으며 소매는 어깨부터 소매끝까지 곡선이 없는 직선배래로 소매끝에는너비가 7㎝정도의 한삼이 달려 있다. 허리부분까지 원만하게 휘어져 곡선을 이루다가 밑으로 퍼졌고 양옆은 완전히 트여져 있다. 이 당의는 앞쪽이 2폭으로 이어져 있는데 이 점이 이 옷의 특징이다. 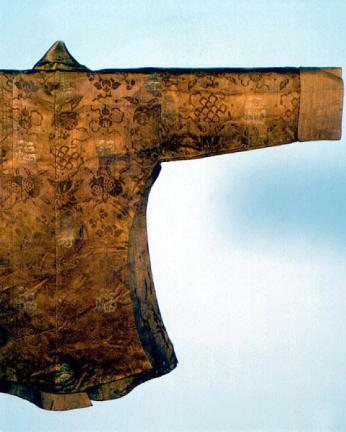 This dangui (ceremonial robe) seems to belong to the mid-Joseon Dynasty period. 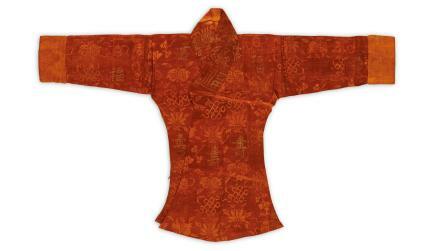 Women of the royal court family and the nobility used to wear this formal dress over jeogori (upper garment). 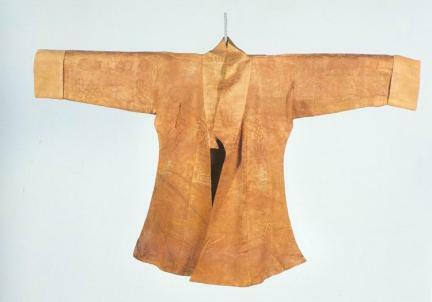 Dangui has a similar shape with jeogori but with long front and back sides and open slit from the armpit down on each side. This dangui was excavated from a tomb. 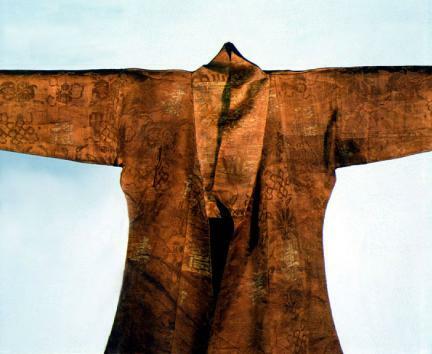 The inside and outside of the robe have faded to yellowish brown, so the original color is not known. 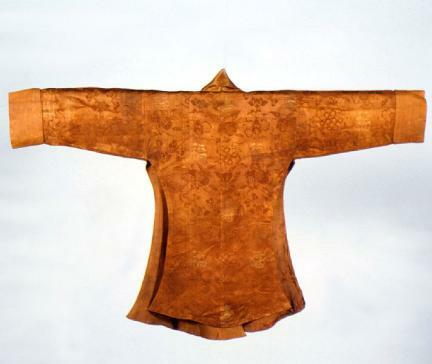 The pattern of Chinese letters meaning “longevity” and “happiness” and the pattern of seven treasures and pomegranates are embroidered on light brown background. In particular, the letters embroidered with gold threads are very noticeable. The collar is wide, and the head of the collar is made in a sharp angle. The sleeves are made in a straight seam starting from the shoulder to the end of the sleeves. The end of the sleeves has a 7cm wide hansam (attached cloth). The robe has a smooth curve line to the waist area and subsequently spreads wider toward the bottom. Both sides are completely opened. 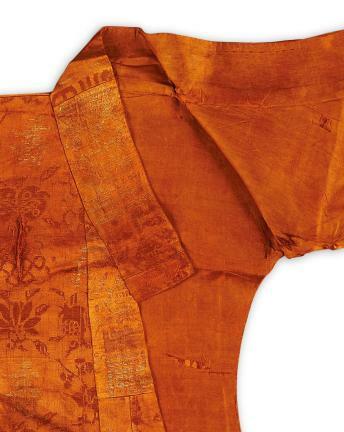 A distinctive characteristic of this dangui is that the front side of the cloth is doubled.